Thousands of miles from home, a group of Egyptian Fulbright Scholars has arrived on the University of Denver campus as part of the Fulbright Junior Faculty Development Program. 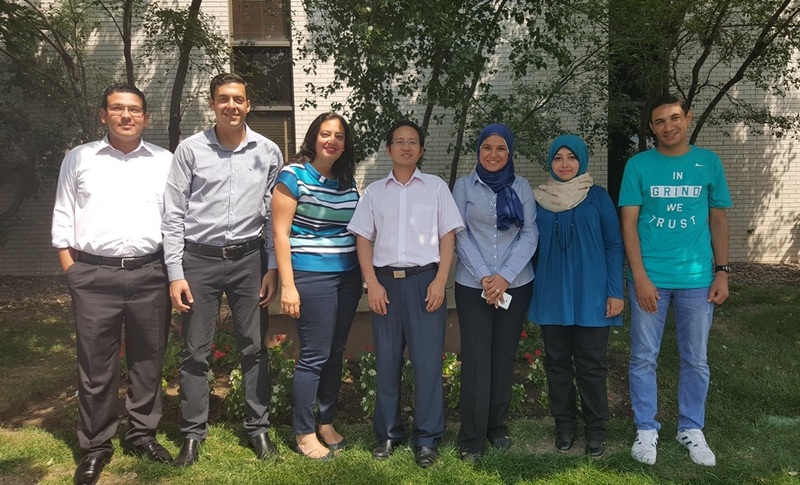 The group of six, who are all faculty members at various universities in Egypt, will be on campus through Sept. 14. The program, which lasts 10 weeks and is sponsored and fully funded by the U.S. Department of State, brings junior scholars to U.S. host institutions for faculty development, mentoring and cultural exchange. While this specific program has been open to other countries in the past — such as Lebanon, Iraq and Tunisia — this is the first time it has been offered to Egyptian faculty. Participants come from six different Egyptian universities: Cairo University, Nile University, Helwan University, Alexandria University and South Valley University. Dr. David Wenzhong Gao, associate professor and director of DU’s Renewable Energy and Power Electronics Laboratory in the Department of Electrical and Computer Engineering, submitted a proposal to the State Department to bring the Egyptians scholars to DU. He also serves as the appointed principal academic faculty contact who administers the program. Gao, along with some of his colleagues from the Daniel Felix Ritchie School of Engineering and Computer Science, are serving as mentors to the group. Nearly 200 faculty members from Egypt applied for the program but only 32 were accepted. The application process included a proposal and CV submission, a list of publications and an interview. Participants in the program could choose from a range of disciplines, including public health, linguistics, and renewable energy and engineering, which is the discipline the DU group is pursuing. The topic is particularly pertinent for Egypt, which experienced its worst energy crisis in decades just two years ago. As a result, the Egyptian government is to invest in more solar energy stations. In fact, the country has launched five stations within the past year. According to the Egyptian Fulbright Scholars, Egypt could become a net importer of gas by 2030 if production levels and reserves do not significantly improve. During the group’s DU visit, they will observe several classes, take part in academic writing courses, attend workshops and seminars, and learn various aspects of American culture. It also creates the opportunity for networking and mutual understanding. “We would like to get long-term commitments with faculty from DU to share ideas and collaborate on other projects,” says Marwa Karim, a faculty member from Alexandria University. Mohamed Abdelrahman, who teaches at Helwan University, says it is important that the group “learn the structure of the education system and teaching techniques.” All of this will help them take what they’ve learned at DU and apply it to their classrooms, so they can enhance their teaching and researching capabilities, as well as their cultural understanding.